It’s that time of year again! 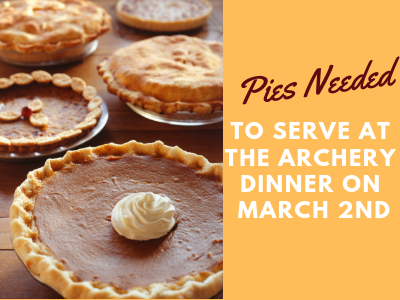 The Archery Dinner will be held on March 2nd and the “Pie Brigade” is asking our bakers to provide pies for dessert. Store-bought pies are also accepted. All flavors welcome! ‘Sugar-free’ options would also be great! Please label the kind of pie and if it is sugar-free. Have your name on the bottom of the container if you want it returned to you. Please drop off your pie(s) to the church on Saturday, March 2nd no later than 12 noon so we have time to cut/prepare them for serving. Thanks so much! Please click HERE to fill out a donation form by Wednesday, February 27th.